Shortest path problems are everywhere with many algorithms and since I haven’t (yet) found an algorithm for this particular one, well, here we go! A friend of mine was developing a microcontroller’s software and faced a particular shortest path problem: the microcontroller had to activate a stepper motor to turn a disk from the current position A to the desired position B. The number of positions of the disk was fixed and predetermined, just like the hours on an analogical clock. There are of course two possible paths: clockwise and counterclockwise. But which is the shortest? Think about an analogical clock and ignore the minute and second hand. Your hour hand is currently pointing to 11 and you want to move it to 3. Do you turn the hand clockwise or counterclockwise? Easy to say, when you are human and visualize the clock/ring, right? But what about a computer? We are working on a circular bidirectional ring-like data structure (like in the image below), where the next of the last element is the first and vice-versa. The ring is divided in finite equal parts, like in the cover picture or like on an clock. The ring parts are enumerated sequentially starting from 0. A start from 1 is also possible. 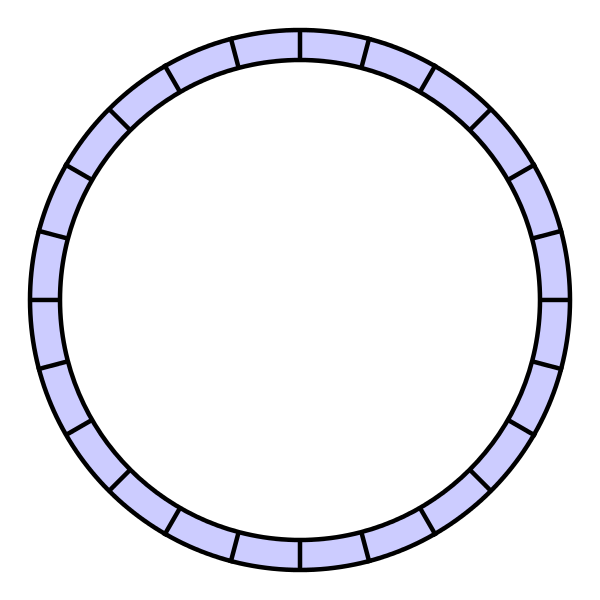 The current position (part of the ring), the desired position (part of the ring) and the circumference of the ring (which is the number of ring parts) are known a priori. All the following source code forms are subject to the terms of the BSD 3-Clause license. The length is expressed as the number of steps to perform, that is the parts of the ring we need to visit. The direction is expressed as a boolean, which is true if we move clockwise, else false. To use booleans we need the stdbool.h library first. We also add stdlib.h for the absolute value function abs() used in the next part. This struct could have been done with an array of two integers, but I’ve chosen this way since it’s more adaptable to longs or even doubles while being more readable. The function that returns the shortest oriented arc between two points on a ring is the following. Note that the function that finds the shortest path is independent of the exact implementation of the structure. The computation is performed on index level. Let’s break it down: between two points on a ring there are two arcs, where usually one is shorter or they are equal. To calculate the first one we calculate distance_1 first. If it is negative, then we are moving counterclockwise and we save false in arc_1.clockwise. As arc_1.length we put the absolute value of the calculated distance (basically it’s the taxi-cab distance). The second arc, arc_2, is of course complementary to arc_1, which means has complementary length and opposite orientation. Of the two arcs, we return the one with the shortest length or the first one if they are equal. Note that the orientation for a movement of 0 length (from start_point to start_point) has clockwise orientation. On the other hand the orientation of the arc with the complementary with same length may be clockwise or not, depending on the start_point and end_point, but it doesn’t matter since the length of the path is the same in both directions (circumference/2). Here is the whole C code with example computations performed for a 12-part ring, like the clock. I know, the title looks scary, but I’ll explain it gradually. This is an example of what kind of abstract data structure may need this shortest path algorithm to find the necessary data faster. You know, theory stuff - and it is not needed to understand and use the algorithm. Also probably the structure is not optimized in many ways, since and array or, even better, a hash table would solve the problem faster and nicer, but it can be an abstract representation of a physical constraint - like moving the hour hand of the clock. Circular structures like the numbers of the clock or the cover image may be created in many ways in software. One is called circular buffer (or ring), is usually based on an array or a dynamic array (a.k.a. arraylist) and used for other purposes. A great advantage of arrays and dynamic arrays is the random access. Imagine you are in position 11 and want to reach position 3: just type my_array and you’re done, but this is not our case. Think again about the clock: you are not able to “just jump” to another position with the hour hand, but you need to travel along a path step by step. Now let’s imagine that our array has no random access, but only sequential: from my current position I can reach only the next one and from that the next one and so on. Linked lists are an example of that. We can then make the list bidirectional or double, as usually called. On a structure like this, we are allowed to move in two directions, left or right as on the Image 1, usually referred as next and previous. If you add the circularity on this list (the last connects to the first and vice versa), you’ll get a circular double linked list like on Image 3. On this structure we may move still in two opposite directions, but it’s better to call them clockwise and counterclockwise since left and right have no sense on a circle (no pun intended). Now we have the structure to represent a ring with finite positions (hypotheses 1 and 2, check!). On this kind of structures we are able to reach any point using two different paths and of course we need the shortest one. We are still missing the third hypothesis: sequential numbers, just like the numbers on our clock or the numbered disk of the microcontroller. Image 4 shows a structure that implements this. Depending on the problem, just the sequential numbers on their own may be of no use (since they give no information). To improve that, each block on the list may point to a data block. Example: each number on the clock points to its string description, so 12 points to “Noon”. This is one of the possible abstract structures that satisfies the hypotheses. Edit 2015-04-28: added Image 4, hypothesis (now) 1, change chapters order and modify text to include the sequentiality of the numbers.